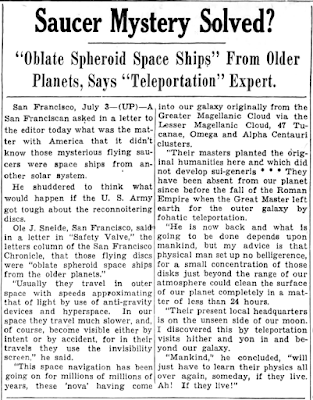 Ole J. Sneide, said ... those flying discs were "oblate spheroid space ships from the older planets." 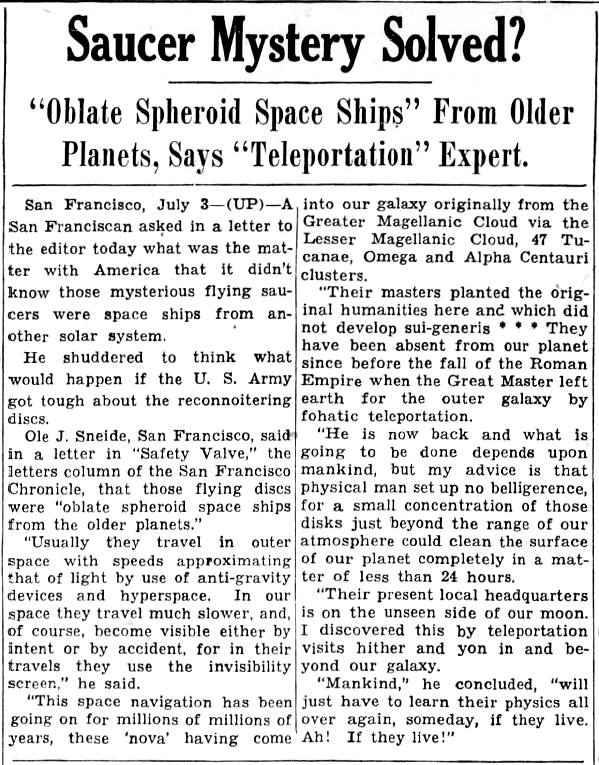 "Usually they travel in outer space with speeds approximating that of light by use of anti-gravity devices and hyperspace. In our space they travel much slower, and of course, become visible either by intent or by accident, for in their travels they use the invisibility screen," he said. "Objects [UFOs] . . . Originate From Some Other Planet"
demanded answers. Were these unexplained radar blips, crafts that in some cases outran jets, part of a nuclear-armed Soviet invasion—a very real threat at the height of the Red Scare? Or were they evidence of something far more mysterious? 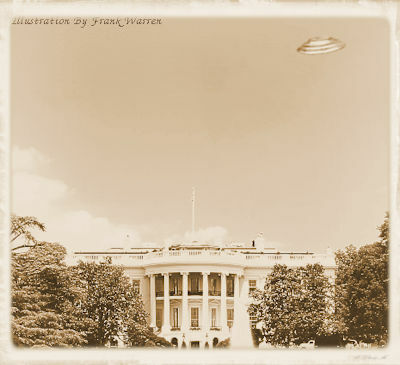 The Washington, D.C. sightings of July 1952, also known as “the Big Flap,” hold a special place in the history of unidentified flying objects. Major American newspapers were reporting multiple credible sightings by civilian and military radar operators and pilots—so many that a special intelligence unit of the U.S. Air Force was sent in to investigate. Mysterious Objects Over Washington Again Today! This report was filled out and filed over the phone with the witness at mufon hq on 9/11/2018 by field investigator l. flechtner 18809.
my friend and i were about 10 years old, it was in september of 1953 or 1954. it was a weekend and we were playing at the grammar school about noon time. it was clear outside no clouds except these four dark grey clouds lined up in a row. we then saw these four vertical golden spheres with a ring around them travel towards the first cloud. they all disappeared into the first cloud and we couldn't see them anymore. them three of them came out and headed toward the second cloud. all three went in and disappeared and then only two came out and headed toward the third cloud. then disappeared into the cloud and then one came out and headed toward the fourth and final cloud. it went into the cloud and disappeared. we guessed that they were very large like a commercial plane size and flying in an elevation under the elevation a commercial plane would fly, but higher than a helicopter. we did have a large military base nearby called quonset point. they named the quonset huts in vietnam after the base. this all lasted 1 to 2 minutes. we never told our parents but remembered it all our lives. we figured they were traveling east and then north paralleling the ocean which was about 1/2 mile away. i now live in florida and a year ago on a cloudy day i took a picture of the sun shining through the clouds and later noticed a grey metallic sphere in the picture. this happened about a half mile up the road from where i live.